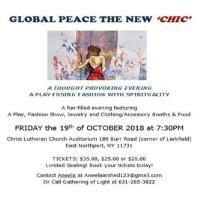 Join Gathering of Light Interspiritual Fellowship for a thought provoking evening, a play fusing fashion with spirituality! A fun-filled evening featuring a play, fashion show, jewelry, clothing, accessory booths and food! Limited seating is available so book your tickets today!